The IBM SurePOS 700 is the industry’s premier point-of-sale solution for enabling high-quality business applications and services while reducing costs and complexity. 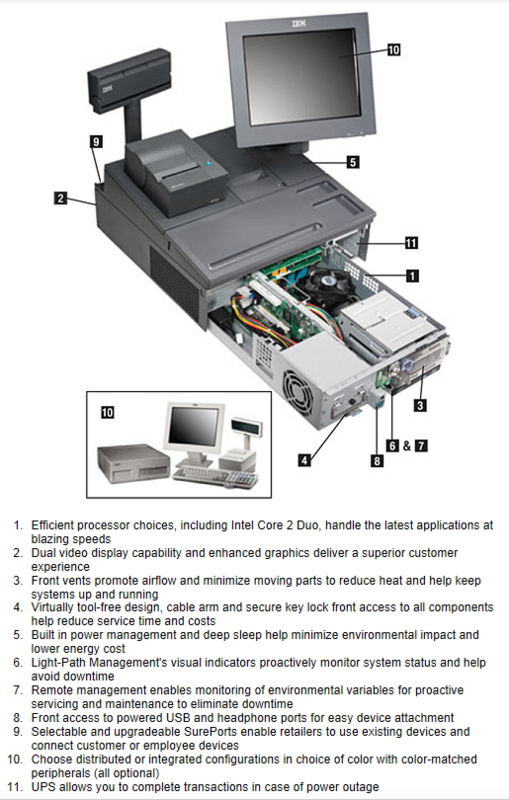 Designed for retail, the IBM SurePOS 700 has the muscle for fast transactions and the brains to deliver unparalleled value. See “IBM SurePorts” chart for connectivity options. C43 and C84 controller models do not include SurePorts. IBM 4690 OS, V6; IBM 4690 OS, V6 R2 Enhanced (midyear 2010); SUSE Linux Enterprise Point of Service 11, with SUSE Linux Enterprise Server 11 SP1; Microsoft Windows Embedded POSReady 2009; Microsoft Windows Embedded for Point of Service V1.1; Microsoft Windows XP Professional Edition with Service Pack 3; PC DOS 2000; Microsoft Windows 7 Professional (midyear 2010 except 723, E23), Microsoft Windows 7 Ultimate (midyear 2010 except 723, E23).